For as long as there have been computer role playing games there has been the paradox of character. How can a game give you control of someone who has feelings, memories, personality traits and a history that you don’t share without you undoing these qualities? How can a strong narrative allow for the main character to be completely amorphous? If I wanted to read I’d go to school. Traditionally, the East has dodged this problem by simply forcing us to control a character whom we have no actual control over. We can steer him left and right, but all of his decisions, dialog, thoughts and feelings are his own. Our job is to control the character in battle and make sure they get to the next cut scene alive. This method allows for a potent narrative and excellent characterization but, for obvious reasons, very little actual role playing. Torment deals with the main character paradox better than any game I’ve ever played. You control the Nameless One, who wakes up with amnesia at the start of the game. Amnesia has been used before in… every game, I think, but it works particularly well here because it is tied into the plotline so well. The Nameless One is immortal but every time he dies he loses his memory (except the hundred times he dies while you’re playing the game). It seems death doesn’t take just his memories, though, when he is reborn he starts with a clean slate and thus there have been Nameless One’s with a myriad of personalities and experiences. You control just one of these lives of the Nameless One. Anything he knows, you know and his personality is completely yours to mold because he has none. The main plotline is short but very rich and allows for role playing without feeling like you’ve got split personality disorder. The supporting cast is very developed and the world is stuffed full of side quests, things to do and people to meet. 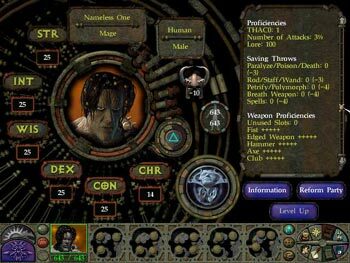 Torment manages to mix the benefits of Eastern and Western RPGs with little of their detriments. The only problem is that it will be hard to duplicate because it’s not done through a gameplay innovation, but through a plot innovation. The Nameless One’s quest is over, how can another game use the same setup? And do we really want every RPG to start us with characters who have explosive amnesia? Torment is a bit of a cult classic and as such has been written about by a million people. Besides explaining its greatest strength I also want to go into its one weakness. Well, besides bugs. Black Isle can’t seem to release an RPG that isn’t chock full o bugs. The same engine (the Infinity Engine) that ran Baldur’s Gate and Icewind Dale ran Torment. From this you could assume that battle would be awesomely strategic. Only in Torment, they aren’t. The camera is zoomed is and spells activate little cut scenes. It’s also almost impossible to harm your own characters. 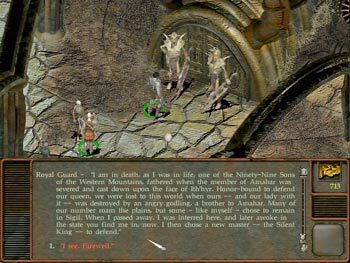 Anyone who’s let a lightning bolt fly in Baldur’s Gate can tell you that if you’re standing by a wall for the bolt to ricochet off, half of your party may be dead by the time the spell fizzles out. Torment doesn’t stick to D&D rules as faithfully as its brothers and sisters and its combat is even a little arcadey. It’s good to know that no matter how mature and well done Torment is, there’s still a statue showing off your teammate’s enormous naked breasts. This bothered me for a long time. Then one day I stopped being stubborn and actually “got it.” I come from the school of “anything better makes everything better” so it was hard for me to grasp that everything is a tradeoff in life and in game design. 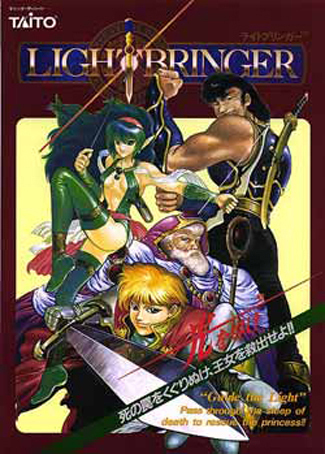 A better battle system draws attention away from the plot, a better plot draws attention away from the battle system and so on. Torment isn’t about fighting, it’s about telling an great story and interacting with characters. If the game had battles as deep as Baldur’s Gate, it’s very likely I’d have spent much more time shopping for weapons, looking at character stats, leveling up and planning strategies. These are fun things to do, but Black Isle knew they were not the crux of Torment and thus toned down the battle system. Torment isn’t just a great game because it’s extremely entertaining. It has nudged me into thinking about games a little differently. If every game I played made me think this much about story and game design, I’d be…smart. Torment is also a game that’s hard to convince people to play. A few of my friends are mildly interested but haven’t made it out of the mortuary, despite meeting the always awesome Morte. I recommend playing the game all the way through because people will be talking about it for years to come. Although, if a flying skull as an ally can’t convince you to keep playing, my whining probably won’t either. Morte is voiced by the same guy who did Yacko in Animaniacs. Reason enough to play. And Nordom is done by Dan Castellana. Also, Whacko is better than Yacko. Christian, that man’s name is Rob Paulsen.He also did TMNT’s Raphael, Mighty Max, Pinky, The Tick’s Arthur, and, for some reason, the Ninja in Twin Snakes. Didn’t Christian Bale do a voice in this game as well? I was rather impressed by the amount of voiceovers and I’m about to play through the game again. The only major downside I have with this game is that there isn’t really much replay value with the same character you beat the game with. Sure you can do the story mulitiple times, creating your character multiple different ways and answering and reacting to things differently, but the thing is you can’t transfer your charcter to a new game or get some crazy cool unlockables for beating the game (not a small feat either).